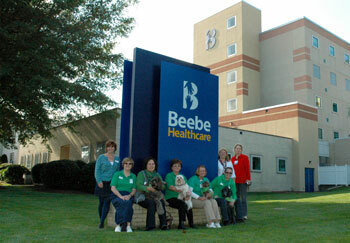 Beebe Healthcare offers pet therapy for patients, visitors, and team members. This alternative therapy has been shown to decrease blood pressure and improve even short hospital visits for patients and visitors. In addition, having a dog visit team members has been shown to greatly reduce stress. Lee Halloran, Manager of Volunteer Services, and Jeannie Briley-Wallo, RN, Director of Patient Relations, read an article about the success of pet therapy programs in reducing stress for staff in the hospital setting. The pair decided to craft a new program to bring this special form of therapy to Beebe Healthcare. Beebe is working with PAWS for People, a Wilmington-based nonprofit 501(c)3 pet therapy organization that recruits, trains, certifies, and places therapy teams in Delaware, Maryland, Pennsylvania and New Jersey. The PAWS organization helps coordinate teams at more than 130 locations, which now includes Beebe in Lewes. To start, Beebe will have five therapy dogs and handlers visiting patients, visitors and team members in the Outpatient Cardiology and Same Day Surgery Waiting Areas. For more information on the pilot program at Beebe, contact Lee Halloran at (302) 645-3531. For more information on Paws for People, go to www.pawsforpeople.org. Caption: Starting in November, Beebe Healthcare is offering pet therapy to patients, visitors, and employees at the Medical Center in Lewes. This program was created through a partnership between Beebe Healthcare and PAWS for People, a Wilmington-based volunteer pet visitation service. Shown (left to right) are Stephanie Barry, Program Director, PAWS for People; Lynne Robinson, Executive Director, PAWS for People; new pet therapy volunteers at Beebe, Lynn Davis of Lewes with Baker, a miniature Australian Labradoodle; Aileen Murray of Lewes with Meisha, a Cavachon; Donna Walker of Bridgeville with Daisy, a Shih Tzu; Kathleen Smith-Jones of Rehoboth Beach with Beau, a Standard Poodle; with Lee Halloran, Manager of Volunteer Services at Beebe and Jeannie Briley-Wallo, RN, Director of Patient Relations.